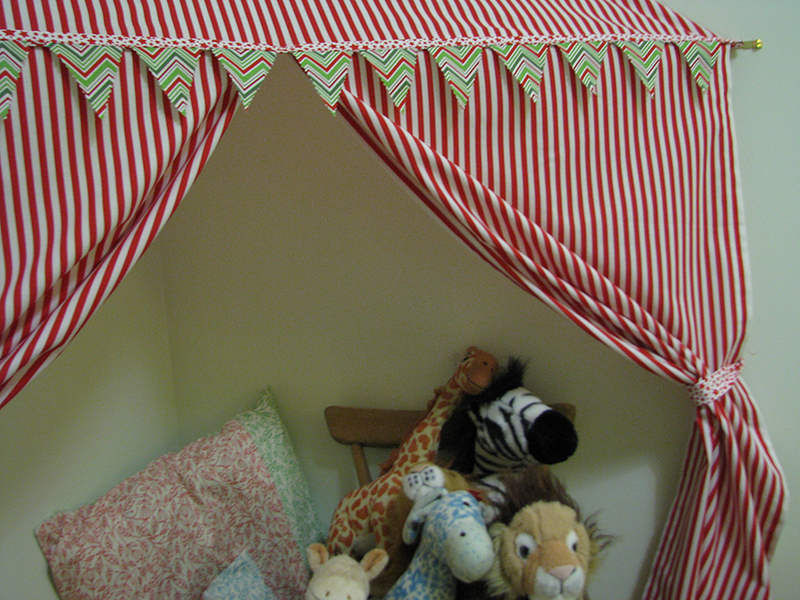 My youngest loves circuses and a little while ago he said he wanted to live in a circus tent. Well, how could I refuse his request? 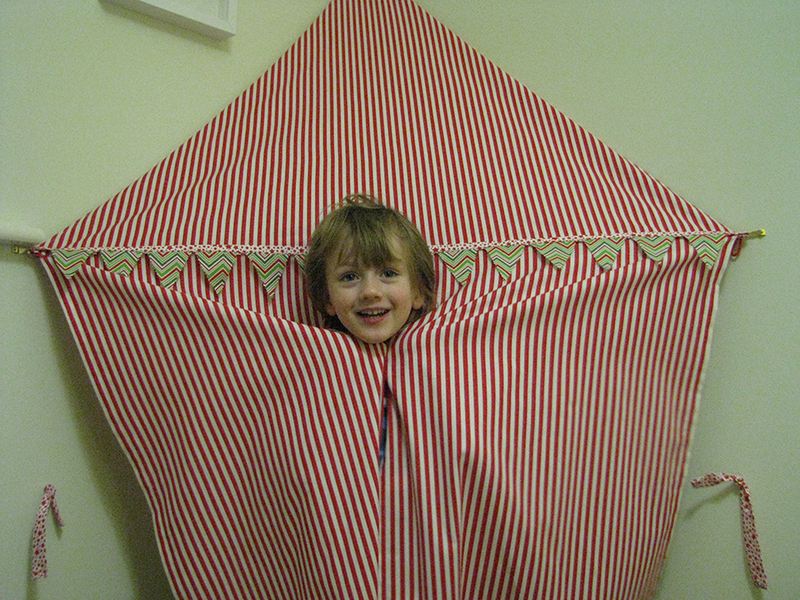 Obviously being only two I wasn't enamoured with the idea of him running away to the circus so I thought I better get a wiggle on and make him his own life-size (correction - Kid B size) circus tent. 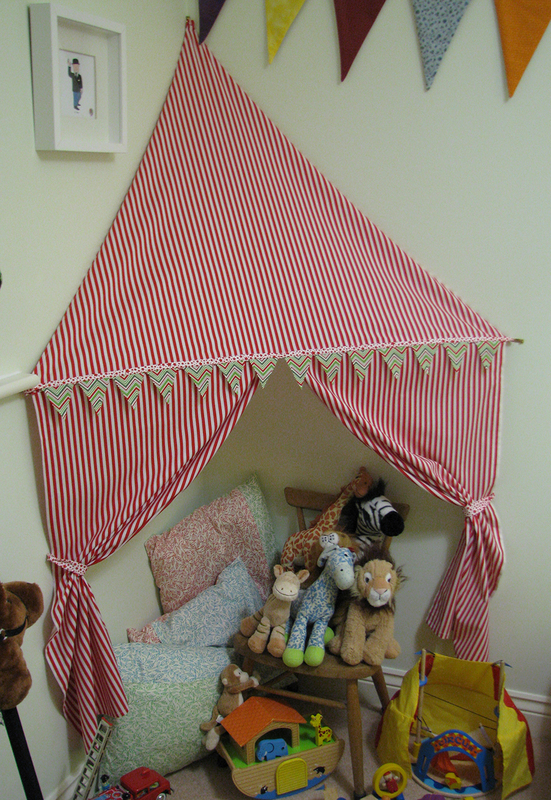 So, a couple of metres of fabric and a string of bunting later, Kiddo has his very own circus tent (he promises he will not now run away to join the clowns - phew!) and . . .
and I have somewhere to hide all of those toys still needing to be given a home after Christmas! 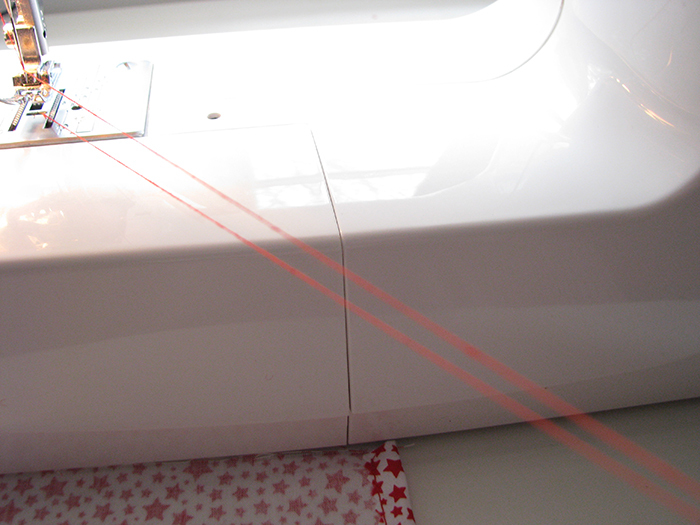 I haven't written a full tutorial on this as it is really as simple as hemming two rectangles and a triangle, sewing them together and stitching the bunting strip to the joining line (the tie backs are so thin that they are a little tricky so below I show you how to make these). 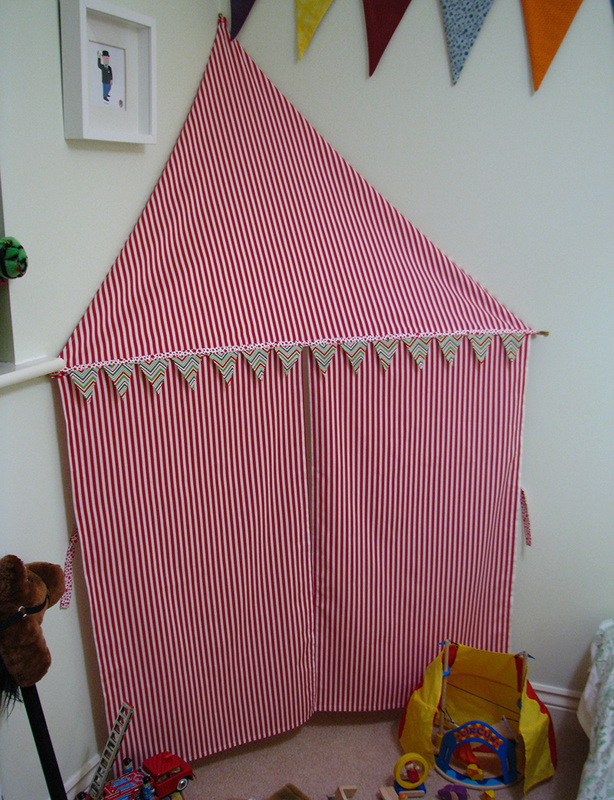 I sewed a loop of string to the tip of the tent roof and at the two ends of the bunting strip and screwed in three hooks at these points on the walls. 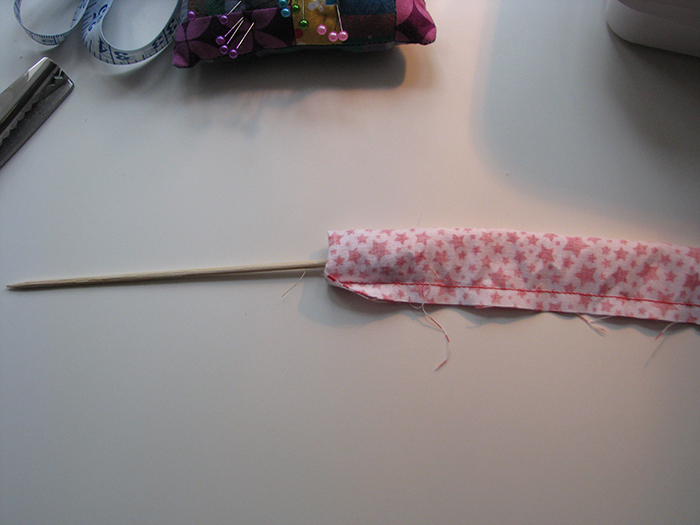 I also added two hooks for the tie backs to attach to, otherwise the sides gape inwards when tied back. 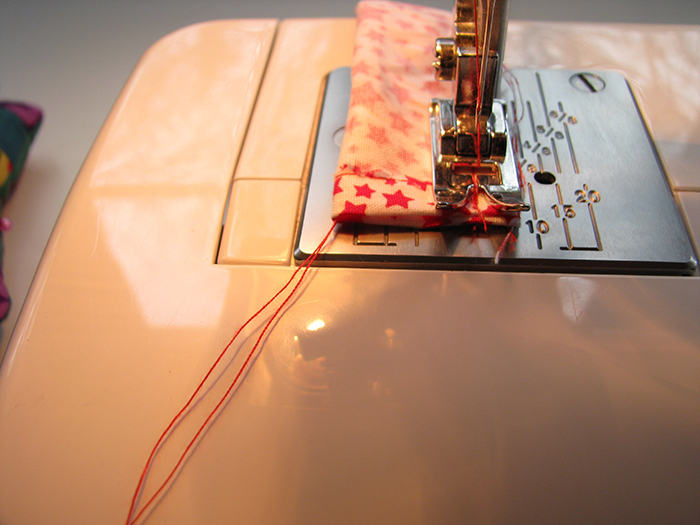 3. before you begin to stitch, open the fabric and tuck the length of thread from your machine down the centre, making sure it is poking out of the end - sew the top end and long side of the fabric, finishing as above. 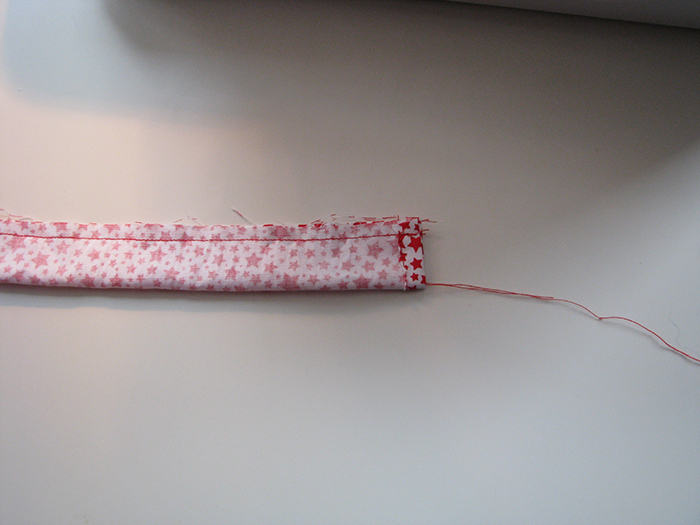 Secure the stitching on the long length with a couple of reverse stitches . .
4. and then place it in front of you on the table. 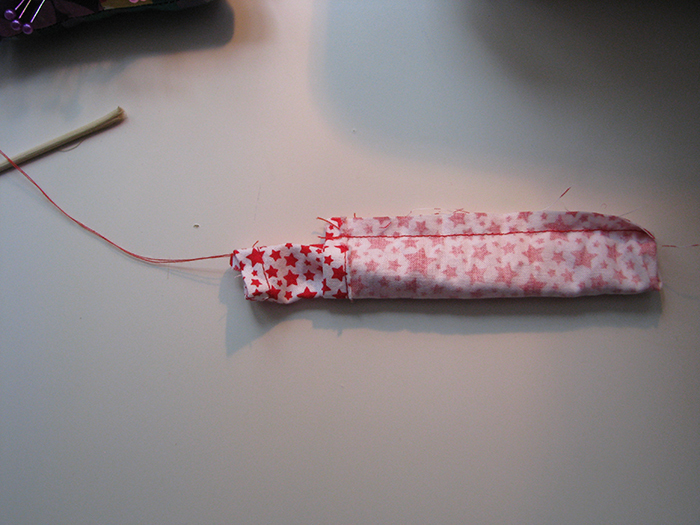 6. begin to pull the fabric in on itself . . .
7. until it is completely reversed. 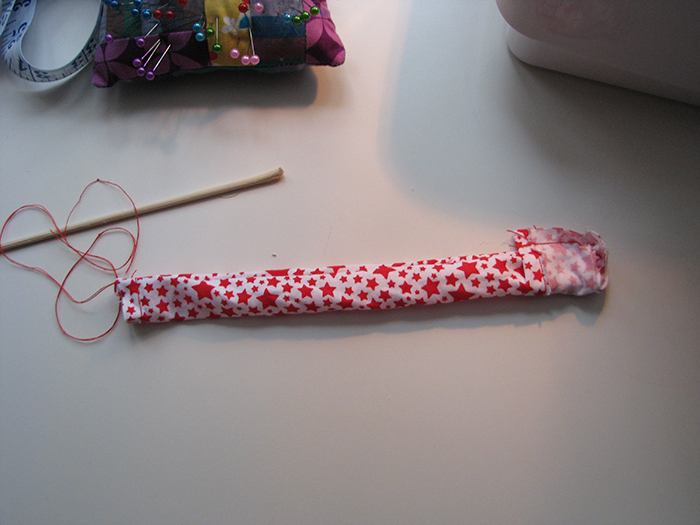 Snip the long threads from the end - et voila! Your thin little tie back is looking lovely and right-side-out-able! Hand stitch the remaining gap and you're ready to sew on your poppers, buttons or velcro - whatever you decide will secure your tie backs. 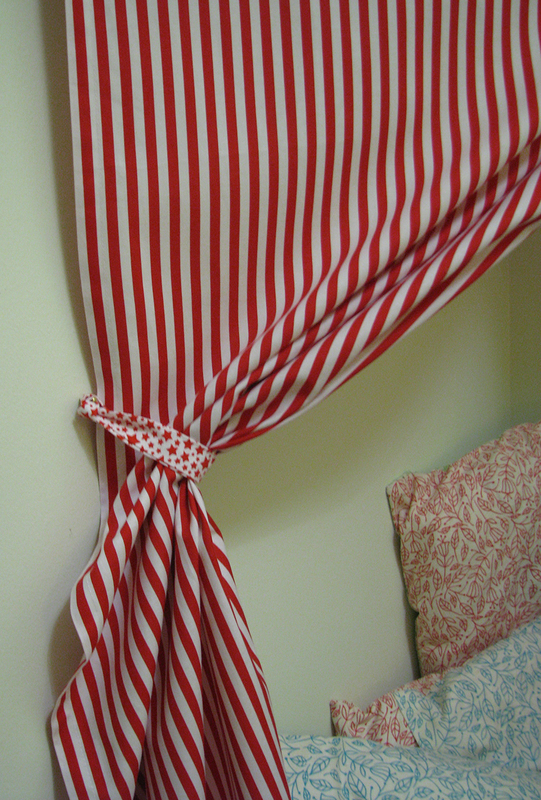 Finally screw some little hooks into the wall and attach your tiebacks to theses to stop the tent gaping when it's open. Little kiddo didn't quite get the idea - but spent the next half hour playing peek-a-boo! Think he's pretty chuffed though and happy to have all the fun of the circus in his very own shoebox of a room! 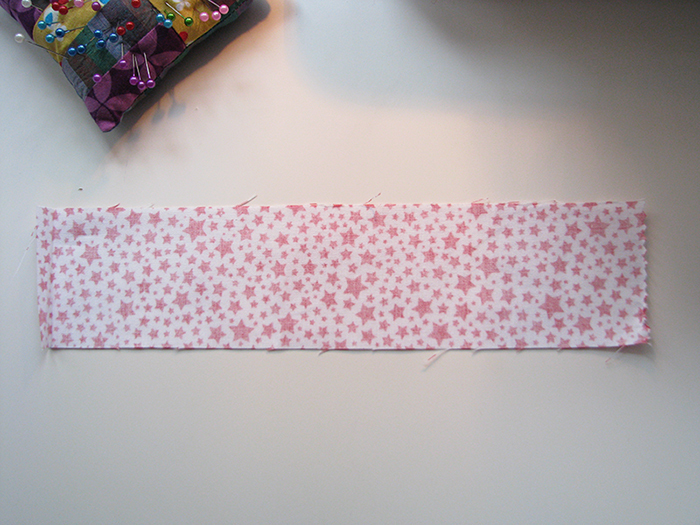 a little strip of fabric for the bunting bias and tie backs - I used Cherry Starlettes here but something like Oh Boy! Aqua Triangles would also look cool. 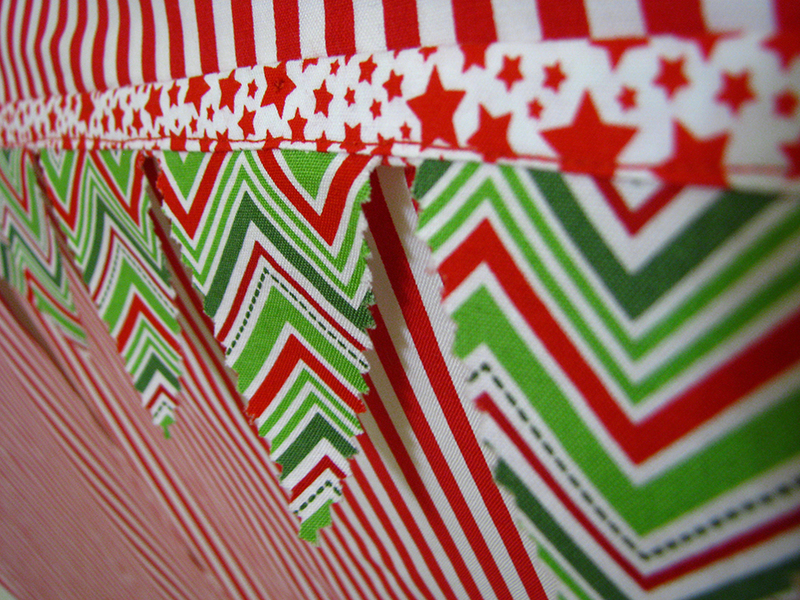 We're out of Tree Line Holly Berries that I used for the bunting flags but anything geometric would work really well. Have a look here for some inspiration! 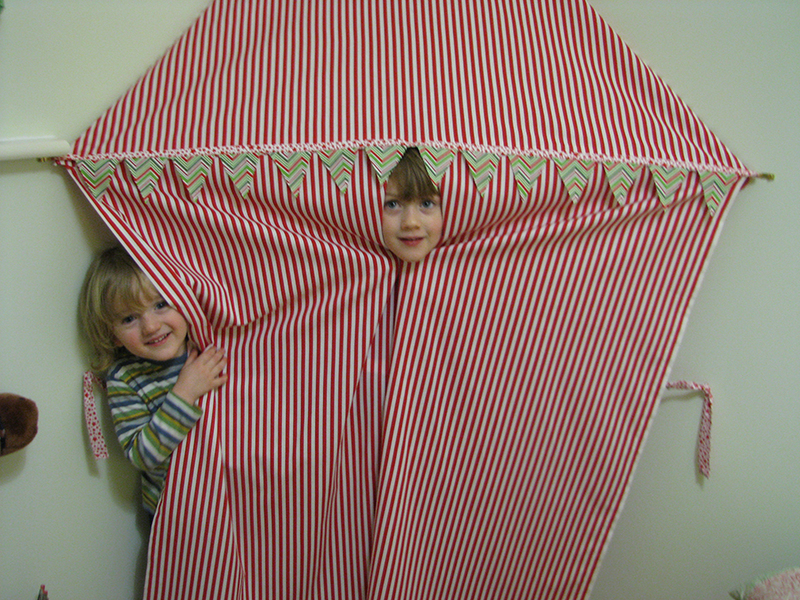 They're a lot bigger now these two clowns - but they still love the circus tent. Not allowed to rearrange Kid B's room because of it. I wonder how big they'll get before it gets passed to someone else?